This is quickly becoming my new favorite…it’s incredibly flavorful and is so easy to make. There are LOTS of recipes for raw Pad Thai out there, I’ve kind of tweaked them all to make this one. The nice thing about this recipe is that you can make it as simple or as fancy as you want. You could just do a basic sauce over the zucchini…but I prefer to add as much of the “extras” as I have on hand. The fresh basil, mint, and cilantro really pump up the flavor. Plus, you can make it look really fancy, which is fun if you are serving it to someone else. I also just received my Spiralo, and I am in love! I have owned a Saladacco Spiralizer as well, but didn’t like it nearly as much. The Spiralo makes these loooooong beautiful spaghetti noodles out of zucchini, squash, carrots…or any other hard vegetable. Bella loves noodles…so this little gadget allows her to enjoy so many more raw dishes. She loves to help too…although there are very sharp blades, so be careful when letting kids help. She loves this Pad Thai, but we’ve also made the noodles with a yummy marinara sauce and that was a hit as well. Raw food is all about texture and preparation…it’s amazing how much more I love eating this dish with the spaghetti type noodles as opposed to just using my veggie peeler to make flat noodles. They are just like the noodles I had at The Sprout. If you’ve been wanting to add more variety to your raw diet, I would encourage you to get the Spiralo, or something similar. There are so many uses beyond the “noddle” function…making salads look pretty is so much fun too! 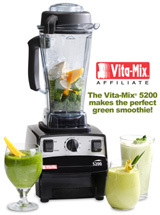 Blend all ingredients in a food processor or blender until smooth. For a thicker sauce, add more almond butter…to thin it out, add more juice. Add more nama shoyu or sea salt to taste. Sprouts! 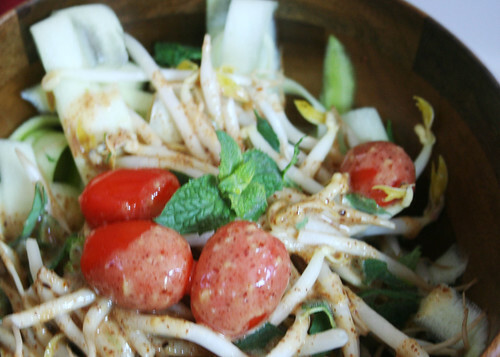 Mung bean sprouts are the best…so crunchy and perfect for this dish, but alfalfa sprouts are great too. Serve in a bowl and/or on top of a large bed of mixed greens. Yum!! Entry filed under: Entree, Raw, Spiralo. OH WOW. That looks and sounds so, so yummy. I can’t wait to get one of these. We eat spaghetti around here all the time, so I would love to be able to make it raw, so I don’t feel like I am missing out. The pad thai looks amazing too! Laurel…you can just use your veggie peeler to make thin “fettuccine” noodles….or you can just julienne them. I’ve been to several raw restaurants who serve it that way and it’s good too! Don’t let the lack of a tool stop you from this deliciousness! Are you reading my mind, girlfriend? I was just having a wicked pad thai craving the other day. THANK YOU!!! I am so anxious to try this!!! My daughter and I had the opportunity to try raw spaghetti at a raw restraunt about 1.5 hours away and it blew my mind away on how fast she ate it…my replica on the other hand was not a hit with anyone! This looks A-M-A-Z-I-N-G! I love love LOVE Pad Thai but never make it at home. It would be so neat to make raw pad thai at home. I can’t wait to try this out and am so glad you mentioned in the comments that it is possible to do it with a plain peeler. I would LOVE to have a spiralo but don’t want to wait to try this until I’m able to get one. ah. just wanted i needed to come over and find here again. this recipe and the others more recently 🙂 . may is my month of sticking to it. i am saying about 80% raw, but i am hoping more like 95% raw 🙂 i need to just write down a bunch of ideas, get to the store and do it 🙂 summer is crazy around here and i need to be feeling my best physically and mentally….raw is the way to go and i know it…..may is going to prepare me so i can stick with it in during our crazy summer. thanks again and again for the inspiration!!! i appreciate it so much! oh sara…its amazing!! we had it last night with sliced zucchini and my whole family ate it right up. i would love to get one of the Spiralo slicers you have. is yours just like the one pictured in the link? its good to know you didn’t like the Saladacco as well. is the spiralo bulky? we have a small kitchen (although no where near as tiny as yours!) so i just want to make sure i am getting the best option. do you have any pics of yall using it? thanks!! and if you haven’t tried it yet, you MUST! The dressing is BRIGHT green because there’s so much cilantro in it. You’d love it. I made this tonight!! I am in LOVE! thank you thank you!!! omg!! This sauce is seriously awesome! Thanks! Must try this raw pad thai!! like women and men don’t seem to be fascinated except it’s something to do with Woman gaga! Thank you so much for this recipe! I made it tonight, and it’s delicious. How many days can I store the Pad Thai in the fridge for?